Home / Word for Today / IT’S A BEAUTIFUL DAY. DID WE MISS IT? This video has already been seen by over six million people via YouTube, Facebook etc. It’s a well told story about a copyrighter who walks past a blind beggar during her working day and instead of continuing on her way, she turns back and decides to act. First, we see that the blind beggar is being largely ignored by passers-by. It seems that his sign, ‘I’m blind. Please Help,’ isn’t sufficiently tugging on the heart strings of those who pass by… but not the copywriter. She cares enough to put her skills to good use and retrieving a marker pen, she rewrites his sign and walks away. Now we watch as people ‘get’ the message and the blind man’s cup is overflowing with generous donations. So what does the sign say now? Are we desensitised by the constant flood of bad news? With so many charities using every form of media to reach our often overloaded day to day schedule, do we need to ‘feel’ the pain of others before we stop and take notice; to get a glimpse of just how difficult life might be, do we need to put ourselves in someone else’s shoes? Purplefeather are the makers of the video called, ‘The Power of Words’ and use this promotional video to suggest that though we see, we do not always perceive, and though we hear, we do not always understand. Far from copywriters being the saviours of mankind, the creators of this viral hit certainly show us what it sometimes takes for us to buy into people’s lives. Is the video really about physical blindness, or the idea that we are so busy trying to survive, that we miss the beauty of what is around us every day? The following short story sums up the message of the video perfectly for me. A little girl boards a train with her mum. They take a seat by the window, opposite a smartly dressed gentleman on his way to work. The girl is excited as the train leaves the station, and in no time at all, she is commenting on everything she can see. As we grow older (and wiser?) we can easily loose the wonder and beauty of what surrounds us every day. The grey clouds cannot hide it; neither can the rain drops wash the beautiful canvass of the landscape away. 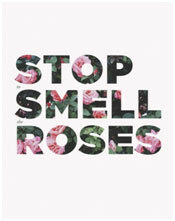 Do we need to stop, think and smell the roses once in a while? Dare I say it, but do we all need to see some things again, afresh, for the very first time?